Little Bit Funky: make for you now. now keep in mind that i have never promised to be a diet friendly blog. health foody? not always but sometimes. this is one of those times where you just have to make something because it's tasty, fast and easy. i'll call this pink sausage dip because that is what color it ends up. brown, crumble and drain one pound of sausage. while hot dump into crockpot containing one regular block of cream cheese that is room temp. add two cans of rotel tomato. heat in crockpot until hot...stirring until all is mixed well. perfectly acceptable to eat as lunch when you are stressed by your children and/or when your house will sell. 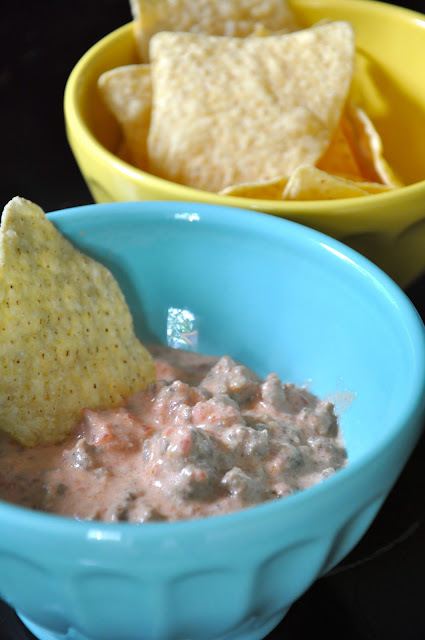 As soon as I saw the pic, I knew it was the famous "pink dip" that my mom has been making for years. She tweaks it a bit by adding a teaspoon of sugar...and I can eat an entire bowl of it all by meself!! YUM-o-Liscious! its official. I think you may be my long lost bff. ha! That looks delightful! YUM! I've always done this with velveeta, but I'm definitely going to have to try it this way! This is very similar to one that I make! Looks sooo good! Mine is 8 oz.cream cheese and mix with a small jar salsa, whatever kind you like. Mix with a mixer and chill. Unfortunately my boys call it "puke dip". I think I will have to suggest pink dip! Boys. ha! We do rotel and cream cheese all the time but never thought to add meat. Love this new concept...must try. Thanks again for the yummy treat. I made 2 cake batter rice crispie cakes for my boys' birthdays last month. Big hit! This sounds cheaper than using Velveeta, too! And I happen to have some cream cheese in the refrigerator right now! Looks yummy!! I think I'll pick up the ingredients on my next grocery trip!! just ate this same dip at a family function! Love it!!!! Oh we make this for Super Bowl Sunday and we eat and eat and eat and eat.......and eat.